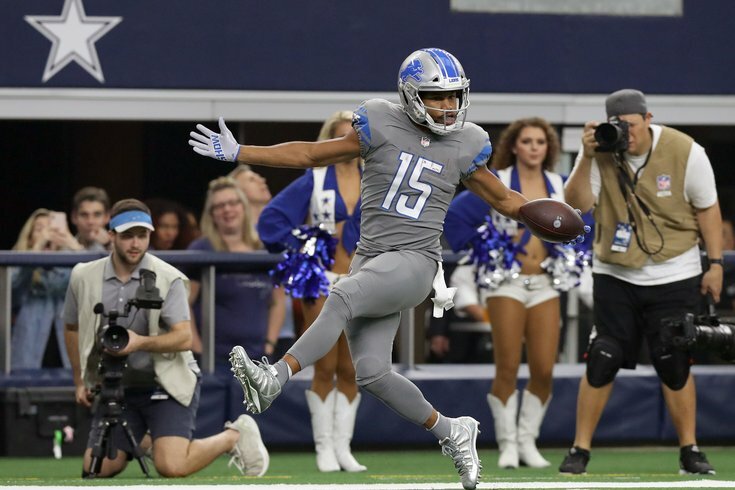 Golden Tate has played well against the Cowboys throughout his career. The NFL trade deadline has come and gone, and each of the four teams in the NFC East made significant moves. The Eagles, Redskins, and Cowboys were all buyers, while the 1-7 Giants were sellers. Let's take a look at what each team did, in order of NFC East standings. In Clinton-Dix, the Redskins acquired a safety with 71 games (65 starts) under his belt in just four and a half seasons. He has never missed a game in his career. In those 71 games, Clinton-Dix has 14 interceptions (roughly three per season), and 3 forced fumbles. He'll likely start opposite D.J. Swearinger on the back end. Clinton-Dix will be a free agent this offseason, and he said himself that he was likely going to move on from Green Bay this offseason, so the Packers flipped him for a fourth-round pick while they could. That is an interesting move from a team that is still very much in the hunt in the NFC. In reading up on the Packer media's view of the trade, the consensus was that Clinton-Dix hadn't played well this season, despite a high rating from Pro Football Focus. The following is from Tom Silverstein of the Milwaukee Journal Sentinel. Still, in a league where safeties are hard to find, the Redskins were able to add a rental (with the potential to pay him long-term) for a mid-round pick, though this is probably not quite the steal that some are making it out to be. We covered the Tate deal in greater detail after the Eagles initially made the trade, in case you want to get into the nitty gritty of it. The Cliff's Notes version is that Tate is a very good player, but he is likely a short-term addition who comes with the loss of a valuable Day 2 draft pick next year on a salary-cap challenged team that needs to hit on as many low-cost players on rookie contracts as they can. Howie Roseman essentially acknowledged that the cost was high, and that the team is very much in 'win now' mode. "You’re always trying to get the best price," he said. "There is no doubt about it. But we’re not trying to win the trades. We’re trying to get really good players. The message to our fans, to our players, to our coaches, to everyone in this organization is our foot is always going to be on the gas. We’re always trying to win. We’re always going to try to put our best foot forward. What we can do now is try to do that for this season and this moment. That’s what we’re going to do and that’s our responsibility." Like the Tate deal above, we covered the Cooper trade in more detail after the Cowboys made this move more than a week ago. The Cliff's Notes version? Lol. The Cowboys desperately needed an outside receiver capable of making plays down the field, and now they have one. So, OK, their trade for him makes sense in terms of filling a glaring need. Of course, Cooper comes at an extremely high cost. To begin, the first round pick is a very valuable resource, obviously, but there's also the matter of Cooper's pay. In 2019, Cooper is scheduled to count for a whopping $13,924,000 against the cap on his fifth-year option. If you don't want to take my word for it, the rest of the league viewed the Cooper trade as a huge value in favor of the Raiders, as sellers raised their asking prices as a result, according to Jay Glazer of The Athletic. That's nothing new. The Cowboys' moronic trades for Joey Galloway and Roy Williams set back NFL trading fun once upon a time as well. And finally, the lone sellers of the division, the New York Giants, actually made out pretty well at the trade deadline. For a guy who simply wasn't very good in his Giants tenure and was once even referred to by one of the leaders of the defense as a "cancer," it's very surprising that the Giants were able to get a pair of draft picks in return for Apple, a first-round bust who was taken 10th overall in the 2016 NFL Draft. The instantaneous reaction from many Giants fans on the Harrison deal was something to the effect of, "We only got a 5?" In reality, that's not a bad get at all. Harrison is a great run stuffer, which is fine, but he is a highly paid, one-dimensional, 355-pound 30-year-old who isn't going to help you by the time the team is good, which won't be for a long time. You may as well get something for him now, and get his money off your books sooner than later. If there's any criticism to be made of the Giants at the trade deadline, it's that they perhaps should have unloaded more players for picks. For example, there were teams (notably, the Chiefs) rumored to have interest in Jenkins, an overpaid 30-year-old corner who will count toward the Giants' salary cap for $14,750,000 in both 2019 and 2020. It would be interesting to see what the Giants turned down for him, if indeed they received offers.